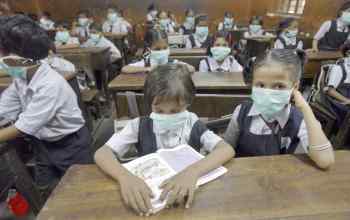 Swine flu on Wednesday claimed five more lives, four of them in worst-hit Pune alone, taking the countrywide toll to 17 even as authorities in Mumbai shut down schools and colleges for a week and cinema halls for three days to check the spread of the virus. Two women and two men succumbed to the viral infection at government-run Sassoon hospital in Pune, official sources said. Pune now accounts for ten deaths and Maharashtra 13. The victims were Shrawani Deshpande (29), Nita Meghani (50), Balu Kuland (33) and Gautham Shalar (48), they said. Nashik registered its first flu death when 28-year-old doctor Rupesh Gangurde died of the viral infection at the Nashik civil hospital this morning. He was admitted to a private hospital on Monday after he complained of vomiting and fever. Besides the deaths in Pune, one person each has succumbed to the flu virus in Ahmedabad, Vadodara, Nashik, Chennai and Thiruvananthapuram and two in Mumbai. Meanwhile, Shiv Sena and NCP appealed to people to observe 'dahi-handi' programmes on the occasion of Janamasthami on a low key to check the virus from spreading. Expressing concern over spread of swine flu and other new types of diseases, Union Health Minister Ghulam Nabi Azad said the government is leaving no stone unturned in tackling them. 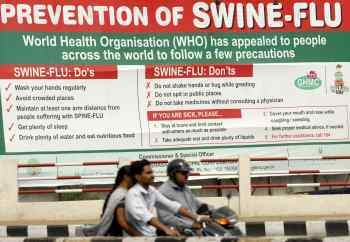 Azad said in New Delhi that, "Swine flu has spread all over the world. I spend four to five hours with doctors everyday. I try to see where we are lacking behind and how much science is yet to achieve. It can be said that there is neither any limit to science nor diseases." A day after the first flu death in Kerala, the state cabinet today met in Thiruvananthapuram and decided to draw up an action plan to check the disease. In Delhi, two children of Food and Civil Supplies Minister Haroon Yusuf have tested positive for the virus and have been quarantined at home. 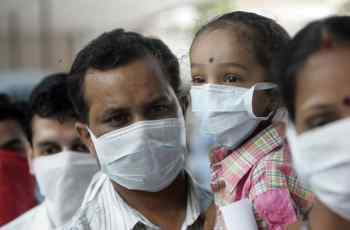 Three other patients with swine flu symptoms have been admitted to the RML hospital in the capital. As the Centre and the states intensified their battle against the infection, central teams have been dispatched to all states and union territories, after Health Minister Ghulam Nabi Azad chaired a meeting of 35 additional secretaries and joint secretaries drawn from various ministries, who would fan out across the country. He briefed the teams personally on Tuesday before they were dispatched to the state capitals. While 14 additional secretaries will travel to the large states, the joint secretaries would go to other states and union territories. The teams would stay there for two-three days and would return by August 15. Azad also spoke to all chief ministers and told them to step up preparedness. The health minister requested the chief ministers to chair the first meeting of these teams so that on-the-spot decisions are taken for swift implementation, a senior Health Ministry official said. 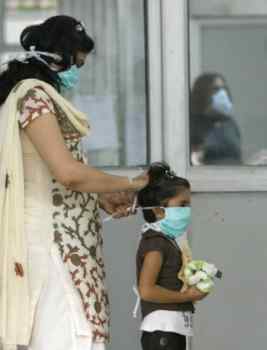 Swine flu: Are you wearing the right mask?